Insightful analysis of data is important whether you are in business or sports. However, the approaches used in these arenas couldn’t be more different. Get granular: Examine the raw data like where players are positioned, who gets the ball from different formations, what plays are called at different field positions, and even what techniques are used by individual players. 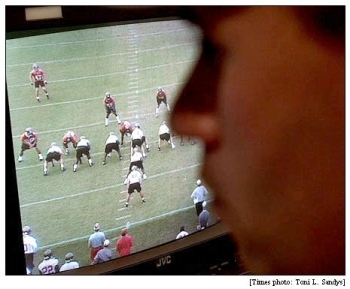 Use your eyes: Rely on your brain’s powerful ability to recognize patterns (or "tendencies" in football-speak). Record these patterns by player, by formation, by down and distance. Create a common context: Given the volume of data, it is important to focus on the differences while holding everything else constant. For the Tampa Buccaneers (and presumably most NFL teams): "every game and practice session - every step, block, throw, kick, zig and zag - is captured on film from two bird’s-eye views: sideline and end zone. The tapes then are intercut so each play can be seen from both angles." Group common patterns; highlight anomalies: The building blocks of analysis become the common patterns. How frequently does the team behave in a certain way? Does this occur more often in the red zone? Also, after watching enough film, unusual actions on the field pop-out quickly. Bottom-up strategy: Finally, use this deep understanding of all the opposing team, players, and patterns as the foundation for the game plan. This type of "slicing and dicing" of the statistics can show the size of the problem (how good is the opponent?) and trends (what are their preferred offensive weapons? ), but it wouldn’t get a coach much closer to figuring out what to do about it. And that typifies the stuck state of analytics in business today. Business intelligence tools are good at reporting and showing trends. These same tools are not good at understanding customer behaviors or complex processes--the types of understanding that provides a solid foundation for marketing, operations, and even corporate strategy. The tools don’t help with the one question that matters whether you are in business or in sports: what should I do based on the evidence? In Part 2, we’d like to share one idea of how to get deeper into the data so you can get smarter: an approach we call "customer sparklines."